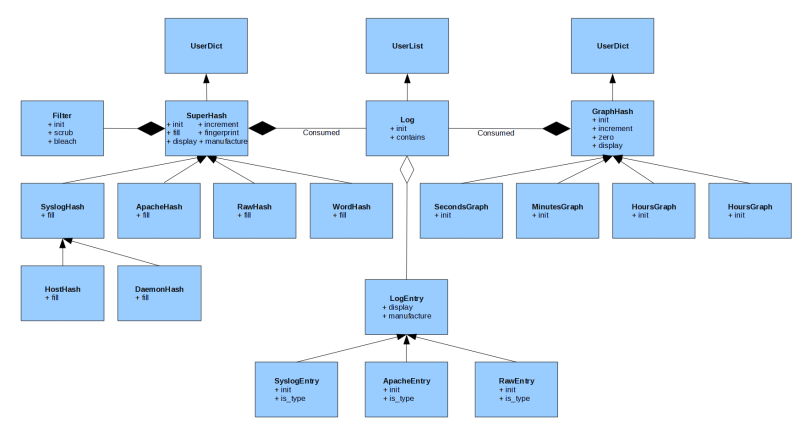 Log analysis is something that all systems administrators know they need to do. Many of us come to this point, either because there is a problem, there is a security requirement from the organization, or it keeps you up all night wanting to know what is going on in all of that data. Looking for best practices for log analysis on The Internet is difficult at best. Many years ago, I discovered a script that hashed log files by removing all of their numbers and replacing them with “#” characters. The results of this simple algorithm were phenomenal, logs could be reduced by a factor of ten. This was much more readable, yet left much of the quality data that I needed to determine if there was a problem. In the years since I discovered that simple algorithm, I have come to discover many techniques on text analysis which are commonly used in linguistics and anthropology to analyze natural languages. This has led me to develop very simple best practices for analyzing logs. Logs are made up of output which are programmed by human beings. There are no real restraints on what is output, other than, some cultural rules on being professional. This makes the output from programs very much a natural language. This also makes the output of someones program an approximation of the reality of what is happening inside a program. This is important to remember, logs are not perfect. When a systems administrator analyzes logs by changing them, he is creating an approximation of an approximation of reality in side a working program. This is not necessarily a bad thing, especially, when the programmer never gives you better than his approximation of reality anyway. In practice logs are made up of certainty and uncertainty. For example, I know what OpenSSH puts in the log during a login, because it is common. On the other hand, I do not now what a Compaq DL380 G3 will put in the log when it has a disk controller error. This is important to remember. After the algorithm has been applied, the output must be read by a systems administrator to determine if it is a normal or abnormal. Then abnormal entries can be acted on, hopefully before there is noticeable impact to your system. Hash a syslog, removing reboots and all standard filters. By default petit will show a sample for all entries which are found three or less times. Create an on the fly driver for a nonstandard file format, then pipe it to Petit. 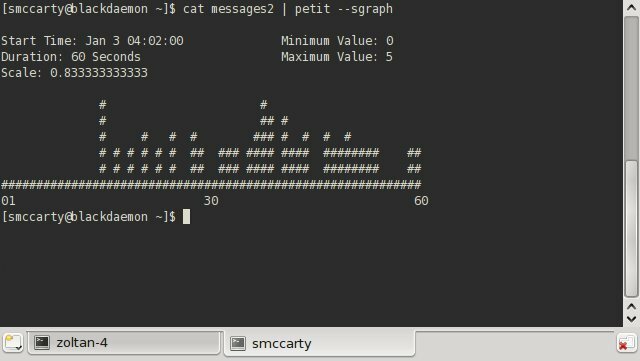 Petit can hash files of non-standard types ok, but graphing requires the time values to be in the correct columns. Just sniffer is a really cool sniffer that outputs in apache access log format. This makes it very easy to use with Petit.